The 6mm bullet family is a large and diverse collection of a variety of different loadings. The 6mm Remington is adopted from a fairly popular wildcat cartridge known as the 257 Roberts, but necked down for a slightly smaller bullet. The 6mm Remington has gone by two different names, of course 6mm Remington, and the .244 Remington. The .244 Remington gained an improper reputation as being inaccurate after a number of Remington rifles due to an improper twist rate. So the round was reintroduced as the 6mm Remington in hope of shaking the reputation for poor accuracy. 6mm Remington cartridge was designed to a multi use cartridge, capable of being a very fast, flat shooting round. The bullet size is often considered to be a medium sized cartridge capable of firing cartridges from 55 grains at 4,000 feet per second, to a 105 grain cartridge just under 3,000 feet per second. The broad range of bullet weights allows this cartridge to be tailored for varmint hunting, medium game hunting, and light soft shooting target loads. 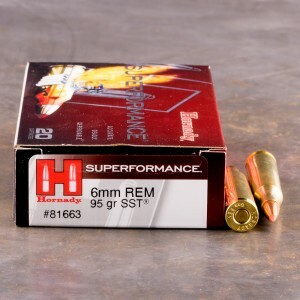 The 6mm Remington is completely capable of taking medium game like the American whitetail, but would be a poor choice for anything much bigger. The cartridge is able to of being very accurate, with a very fast velocity and a flat trajectory. The 6mm Remington is a multi use cartridge that is capable of being tailored to the shooter’s need. Shot 3 whitetails with them last year all 3 dropped in there tracks. I use this ammo in my Remington VLS with 6-20 pwr scope for coyotes that are a threat to my livestock. I truly believe in this ammo & have made shots using 6mm that have totally surprised me. Difficult to believe it has become so hard to find. In my opinion it is much more dependable than the popular .243, and I have owned both. 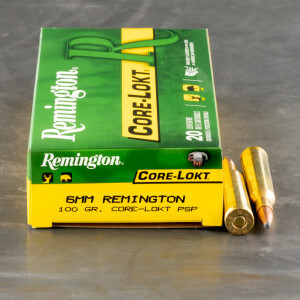 Been looking for Remington 6mm for a while and finally found them on Ammo2Go. I love shooting this gun..